Last Friday the all new Bombardier CSeries short- to medium-range single-aisle passenger jet operated a scheduled service for the first time. 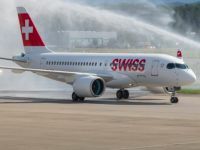 Flying for SWISS, the fully-booked 125-seat two-class Dash 100 aircraft took just 1hr 25min for the inaugural flight from Zurich to Paris Charles de Gaulle. CSeries aircraft will be introduced in the coming years gradually, replacing the very successful Avro RJ100. Regular SWISS travellers will be delighted to see the same layout, 2+3, similar 30/32in pitch, plus wider (18in), and much more comfortable seats, which also slightly recline. Innovations include a huge overhead storage bin, ideal for operations where the majority of customers will have carry-on luggage, and extra-large windows measuring 11x16in, positioned high on the sidewall to provide an optimal viewing angle and natural light. They are nearly as big as those on the Boeing 787, although offering sliding blinds rather than the sophisticated dimmers on the Dreamliner. A one-piece folding table comes out of the seatback, which also has a pair of holdalls for water or beer, or both! 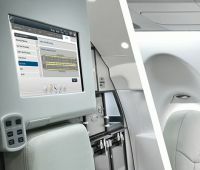 Novel is a small individual screen showing the usual flight information and maps, plus a safety note which lights when a seatbelt is advised. From a passenger point of view, the new aircraft is a delight, giving a much better ambience than the competing, and smaller, Embraer E series (2+2) and offering a cabin height of 83in against 79in. Bombardier may have found a niche in the marketplace for an aircraft that does not really have a competitor, with a maximum 133 seats (100 series) or up to 160 seats with the Dash 300. The new Embraer Ejet E2, first seen publicly at Farnborough last week, is an updated version of the original Embraer 170 which made its maiden flight in February 2002 and has sold well, with 1,200-plus delivered and an order book for 1,400. The E2 will appeal to established E series operators, but, with the CSeries, Bombardier has gone for an advanced composite wing and fuselage plus brand-new Pratt & Whitney geared turbine engines said to give a 20% fuel burn advantage over competitors and much fewer emissions. The recent order by Delta Air Lines for 75 CSeries 100 would indicate that the Montreal (Canada)-based company is not competing with Airbus/Boeing, whose A320 Neo and 737 MAX are another size up, starting from 150 seats. The smallest Airbus, the 132-seat A318, is now well out of production, with just 50 in airline service including two for British Airways with just 32 seats and used on the London City – Shannon – New York JFK service. Rumour has it these could be replaced by 50-seat CS-100s non-stop both ways and also as far as Moscow and Qatar. The gestation of the CSeries is fascinating and starts with the BAe/Avro, originally called the DH 146, a De Havilland product by the company that once owned the forerunner of Bombardier Aerospace. There were 387 of the four-engine “whisperjet” built and around 70 remain in service. With its remarkable runway performance, it could be argued that London City Airport would not be what it is today, a £2bn enterprise, without the Avro. As the BAe 146, it first flew in September 1981. A twin-engine version was proposed by the Hatfield design office but did not proceed due to a combination of negative marketing/management and political forces. A little later, Airbus came up with another four-engine aircraft, the A340, but with this airframe a twin also emerged, the A330, still with us and selling well in an improved form, and clearly a money spinner for Toulouse. Had BAe continued with the Avro Twin, perhaps the CSeries would never have existed. In 1992, Bombardier put into production its CRJ series of regional jets, the aircraft a development of the Canadair Challenger executive jet. Both, in much developed form continue in production. Shortly afterwards, Bombardier tried to buy the bankrupt Fokker company, noted for its short-haul passenger aircraft. It was clearly looking at the market one size up. In 2002, the German manufacturer Dornier went into liquidation with its twin-engine Avro lookalike, called the 728, about to make its first flight and a 50-aircraft order from Lufthansa signed for. SWISS is 100%-owned by Lufthansa. Bombardier was reputed to have investigated taking over that project. In 2005, it made the decision to develop the CSeries as a partner for its Q400 turboprop and CRJ lines. The composite wings and part of the fuselage were to be manufactured at a purpose-built state-of-the-art factory at Belfast, with final assembly in Montreal. 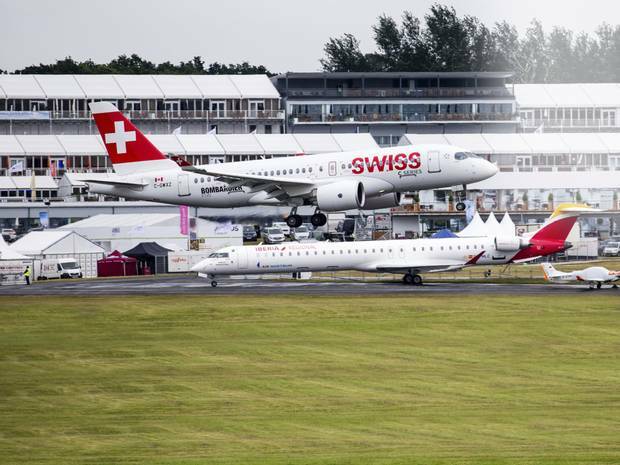 Development slowed during the economic downturn but now, with both the 100 and 300 series certificated and 370 firm orders from airlines all over the world, things are looking up at SWISS. Will its Lufthansa owner’s confidence be justified? Fifty years ago, it was the lead carrier for the Boeing 737. The omens look good. It would seem that the original De Havilland concept of a 2+3 layout is the ideal compromise for travel, not the 3+3 of the utility-style Airbus, nor the psychologically-cramped 2+2 Embraer cross-section. Only time will tell, but Northern Ireland employment depends on a good many more orders. In addition to Paris, Manchester, Prague and Budapest have been the first SWISS destinations to receive the Bombardier CS100 service over the past weekend. As more new aircraft arrive, they will be joined by Warsaw and Brussels at the end of August, and by Nice, Stuttgart, Hanover, Milan, Florence and Bucharest in September. The Zurich – London City route is scheduled to change to CSeries service in the first quarter of next year. BTN agrees. Passengers will like the new aircraft. However, it is up to the airline bean counters to make sure it works economically. We all adored Concorde.